First of all, I have just become aware of a wonderful year-long 'pink' project being spearheaded by Vicki of 2bagsfull. We are being asked to make or purchase a scarf in predominately pink colours and send them to her and in turn she will see that, come next October, the scarves are given to women going through treatments for breast cancer. Along the way Vicki has planned to have some givewaways for those that participate. More information for this worthy endeavour can be found HERE. Found via Suziqu HERE. Aren't these gorgeous little treasures? They came beautifully packaged too (and I forgot to take a picture...oops). Hopefully you can see the lovely detail on the glass button! All these came from a great on-line store HERE. If you're looking for crazy quilting supplies be sure to go and visit Thearica! 1. Have a look at the beautiful Brazilian rolled roses project that Elizabeth has done HERE. Stunning work! 2. If you like birds, go and have a look at Michelle's sweet little felted cardinals HERE. So adorable! 3. Clarissa has done something that I keep going back to and looking at (there just might be some drooling going on too). Go HERE to see! and, finally, if you're interested in a number of different free crafting articles go HERE. I've subscribed because there is lots of good material to be had. Be sure to check out the categories and also scroll down! Pretty in pink? And be safe!! We're expecting high winds and rain here which is nothing in comparison with what is predicted to happen elsewhere in the path of the storm. The news reports are quite frightening at the moment. Now, on to things that are more fun.... More Pink!! So sorry, but there's more pink today! .... a knitted (and felted) wine bottle carrier I made for a Christmas present for a friend who makes her own wine. Thought the flowers would make it a touch more feminine! This is a lovely little cross stitch pattern designed by Pam Kellogg. It was great fun to stitch! Yes, I know....it's pink, and Christmas trees are usually green. Once you see the whole project you'll understand why it's pink! I don't have any pictures for you today, but perhaps I can send you to some places where they have LOTS of pictures instead. These sites all have free images for download for use in your artwork and/or stitcheries. If you know of any more sites, please add them to the comments so we can all have fun exploring! Now to fire up the knitting needles!! 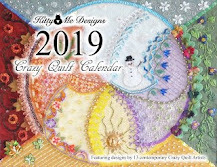 First of all, I want to tell you about what my friend Pam Kellogg is doing that will be great for anyone interested in learning more about crazy quilting. She is offering online classes focusing on color and composition, something that we all struggle with from time to time. I know Pam will make the classes fun and the cost is very reasonable. Go HERE for more information! * TUSAL? Totally Useless Stitch A Long!! Thanks Daffycat for doing this! We had our #1 son home on the weekend and he, being a chef, decided that we should be guinea pigs for a recipe he wanted to try out. As if we'd turn THAT down!!! Now doesn't that look good?? 1. 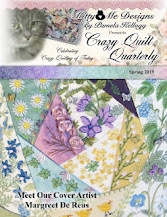 Pat Winter has just finished her crazy quilt calendar for 2013 and it's beautiful! I have my copy on order (and a spot on my studio wall reserved for it). You can get a preview (and order your copy) HERE. 2. I have rather a fascination with hexagons at the moment (thanks to Karen Ruane) and Michele has completed a quilt top that absolutely is stunning. The hours of work pleasure that went into making it simply boggle the mind. Go HERE. Today will be a hodgepodge of things you might (or might not) be interested in. I've been stitching, but not on anything I'm able to show just yet. - if you like miniature things (of the dollhouse sort) go HERE to see some fabulous 'littles'. I'd love to have a dollhouse, just so I could decorate it with some of these treasures. - if you are looking for hints for stitching with metallic threads (we all know how pesky those can be), go to Kreinik's post HERE for some great hints. - next, how about giving your sewing machine a treat and cleaning it? Go HERE for some great how-to instructions with very clear pictures. - when I was looking around for easy to make gifts for Christmas I came across a really great idea for making cozy fleece blankets. Easy and cheap to do, and a welcome gift for old and young alike! Go HERE for the instructions. EDITED TO ADD: Apparently, when you initially go to this link it comes up with an ad for Seventeen magazine. Just click on it again, and it should work okay the second time. Sorry 'bout that! There, that's my Hodge and Podge for today! Enjoy! This is Thanksgiving weekend here in Canada, which will mean the consumption of lots of turkey and trimmings. We'll be joining friends on Monday to celebrate the day and, in all likelihood, eat FAR too much! Today Mary Corbet (of NeedlenThread) has a review of silk gimp thread on her blog HERE. I was quite interested to read her post because back in the day (probably about 60 or 70 years ago) my mother worked with gimp to make belts and small purses. I undertook a search for the thread several years ago and had no success. It's nice to know it's being made again. On a total 'nother topic - last night I did something extremely scary and modeled in a fashion show. Yep - me (who is terrified of getting up in front of people) actually walked the plank runway. If I had been writing a bucket list for myself I know that modeling wouldn't have been on there! On the plus side I didn't fall on my face AND I think I put the clothes on right side out (which I'm sure was a bonus). Sorry folks, nothing exciting being created the past couple of days on this front, so no pictures to show you. However, there are a couple of exciting things happening (or about to happen) in the crazy quilting world. Firstly, Pam Kellogg (of Kitty and Me Designs) is poised to issue volume 3 of her crazy quilt seam treatments and, by the sneak peaks she's given on her blog, it's bound to be great. Can't wait to get my hands on a copy! Secondly, I see that another crazy quilt guru will be having a new book released on November 16th. I've already pre-ordered my copy and can't wait to have it in my hot little hands. Judith Baker Montano is well known to anyone who crazy quilts and this book promises to be a great addition to any library. "Free-Form Embroidery" is available for preorder on Amazon. I had a great time today meeting an on-line friend and her husband who had driven up to visit relatives in Toronto from their home in the US. We arranged to meet at their hotel and have lunch with them. Of course on-line stitching friends can't get together without a big show and share session (the mens eyes glazed over, but they were good sports) and a wee exchange of gifties. My gift for her was one of the pincushions I showed yesterday and imagine my surprise when I dug into a giant bag of white stash enhancement which was her gift to me! I will be stitching with white for some time to come (and loving every minute of it I might add). just after we'd finished a delicious lunch. Thank you Freda and Harv for a delightful day! How I wish I had a figure this good!! These will be gifts for a couple of my friends - hopefully they'll like them! Tomorrow I'm doing something really special (provided nothing happens to mess it up). Keeping fingers crossed! I will reveal what it is tomorrow.